Making their premiere in the Sanfermin Running of the Bulls, the Torrehandilla-Torreherberos bull-ranch featured in a frenetic and dangerous running over a packed course, filled with runners who did not want to miss this last chance to take part in the final running of the bulls of Sanfermin 2012. The bulls covered the course at a very fast pace and they created several moments of intense tension along the different stretches of the course, swiping at some of the runners with their horns and knocking others over as they charged ahead at full speed. A brown-colored bull raced ahead of the others at City Hall square and ran ahead all the way to the bullring alone. This bull knocked over several runners as it raced along at a frenetic pace. The pack came out of the pens in a compact group and continued to stay close together up the slope of the first stretch at Santo Domingo, but when they reached City Hall square, the brown-colored bull raced ahead and lead the others for the rest of the way as far as the bullring, setting a frenetic pace as it charged along. The pack of bulls coming behind began to stretch somewhat as the bulls moved up Estafeta Street and the runners were able to get in close to the horns of the bulls on this final day of the bullrunning to show off their skills at running in front of the horns. This was not easy as the pace was extremely fast and the course was tightly crowded with runners. As soon as the brown-colored bull entered the bullring, it was quickly followed by one of the black bulls and close behind by the rest of the pack. The bulls quickly made for the safety of the pens on the far side of the arena but the rear black bull knocked down a runner who had crossed its path and it got distracted. It began to trot around the arena tossing its horns at the runners gathered in the ring. However, the "dobladores" with their capes quickly worked together to lead the bull towards the pens and it finally entered without more ado. The whole running took just 2min. 23sec. 1 running bulls. 0 goring. 4 traumatisms. The 59th fastest running of the bulls. The 1st was on 07/13/2011. 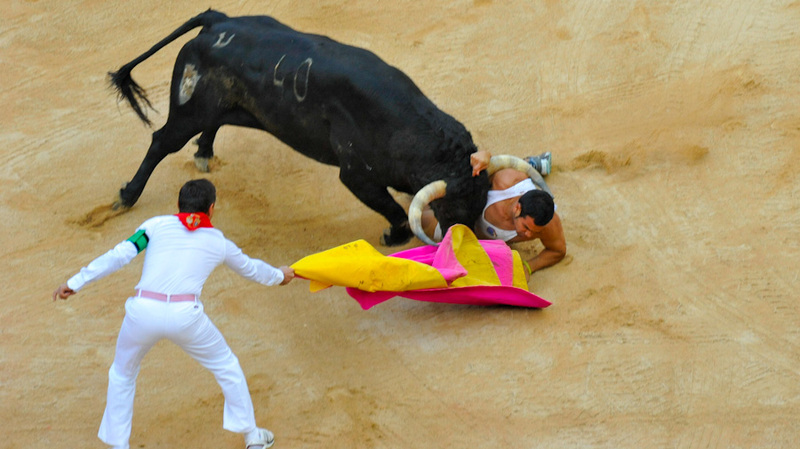 The 21st time that there are 4 or more injuries from bruising in a running of the bulls held on 14th of July. The 19th time that there are no gorings in a running of the bulls held on Saturday. The 3rd fastest running of the bulls ever held on Saturday.